COMPACT AND LIGHTWEIGHT: Weighs just over a pound. Extends to 21.5, 30, 39 and 50. Minimum Height: 15.5. 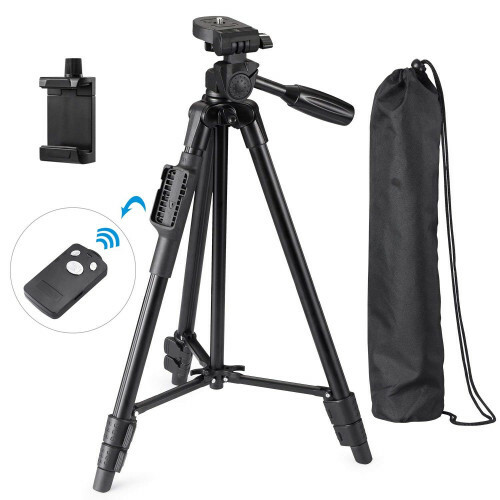 WIDE COMPATIBILITY: Compatible with most video cameras, digital cameras, still cameras, projector, GoPro devices, smart phone adapters (not included). UNIVERSAL CELLPHWIDELY COMPATIBLE: Compatible with most video cameras, digital cameras, still cameras, projector, GoPro devices, smart phone adapters (not included), and scopes. ONE HOLDER: Supplied with an adjustable clamp(length: 5.5~10cm) to mount almost every type of phones. RECHARGEABLE REMOTE: 60mAh rechargeable battery, charging time about 45-60 min. Shooting time about 20-25 hours. The zoom in/out is not suitable for some cellphones, and some cellphones can only use zoom button for shutter. 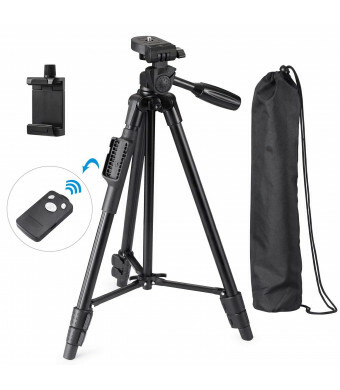 Equipped with a wireless remote shutter, you can take picture simply by pressing a button. Anti-skid rubber plate with 1/4" screw to mount your camera / phone stably. Supplied with an adjustable clamp(length: 2.16in ~3.94in) to mount almost every type of phones. 3 sections of aluminum alloy legs, maximum length can reach 50in. Lightweight and compact design, folded length only 16.2in.